A while back, the three-headed Jalopnik asked readers which Mustang variants from the past they'd most like to see come back. I voted Mercury Cougar, but then almost immediately realized how wrong I was when I ran into a bright-green 1971 Mustang Mach 1 at the liquor store. 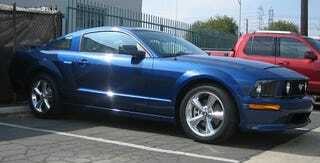 Well, never mind the past; here's one from the present: The 2007 Mustang GT/CS. Building on the retrotastic good looks of the mostly beloved new 'Stang, the CS (for California Special) package adds the following: blingy 18" polished aluminum wheels (as opposed to matte 17s on the GT), faux side scoops, CS-specific striping, a much slicker and sportier looking front fascia and an honest to goodness rear diffuser, complete with flashier pipes. Short of the upcoming Shelby GT, this is the best looking new Mustang burning up the space between stoplights. Your $3,000 over the base GT's MSRP also nets a "Parchment" interior and black leather seats with "GT Leather" inserts. And... that's it. While mechanically identical to the common Mustang GTs prowling the boulevards of America, the CS offers one very noticeable performance difference: dramatically improved handling via the 18" wheels. It's to the point where I wonder why Ford even bothers with stock 17s. While it's cute (for about five minutes) that the base-level GT can hang its rear around any corner, the CS is a much more serious performance proposition. If you really give it some in a bend, the CS will happily wag its tail - and that's with the traction control on. Obviously, what pistonheads love most about the Mustang is its engine. Sure it's a 9,000-year-old design, made from pig-iron and memories of cheap gas, but this bad mutha idles at 8 rpm. Not eight hundred, eight. At 80 mph you've barely broken 2,000 rpm. There's so much torque on tap (320 lbs-ft. at 4,500 rpm) it hardly matters what gear you're in. Just kick a little harder and it's a guarantee you'll be going much faster than the guy next to you. Case in point. Finding myself traveling at a considerable clip in third gear with the engine purring along at 4,000 rpm — just 500 revolutions from the three-valve 4.6-liter's sweet spot — I goosed the throttle to pass slower traffic, and the mill started hurling thunder and lightning. Unlike most cars, which would be contemplating the end of the world in similar circumstances, the Mustang just shrugs then gets back to its nap. Nonetheless, all of the usual Mustang (and by that I mean Ford) drawbacks are present: pathetic brakes, sloppy clutch, crappy shifter, underdone interior, pint-sized sway bars and frightening drive-line clunk. But these negatives should surprise no one and, most important, are forgivable due to the California Special's righteous on-road personality. Mustangs make men smile. If bona fide American grunt in relative comfort is your thing, you'd be hard pressed to find a better mistress than this latest Mustang derivative.